J&B’s first kiss was at LAX airport – a fitting spot since their life together so far has been a whirlwind of adventure! With a first date in Hawaii that lasted five days, a long-distance courtship between NYC and LA, and a surprise proposal in Philadelphia (in a Mexican restaurant! 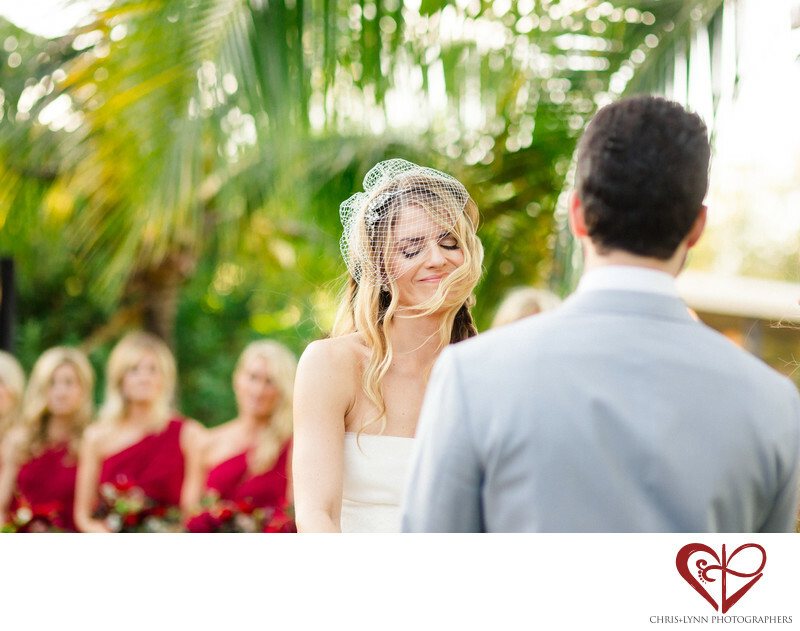 ), a Riviera Maya destination wedding was the the perfect choice for this jetsetting couple. Set at the lush Rosewood Mayakoba in the Mayan Riviera, Mexico, their wedding was a vibrant party full of color and laughter. Sarai & Martha of Signature Weddings worked with the bride and her mother to design a relaxed weekend of casual elegance; I loved the pop of red flowers against the green palms, and every detail – from the bride’s Jenny Packham headpiece to the feathers on the placecards – was unique. But what I loved most about this wedding was the ceremony. “Months and months of planning all for this moment,” I overheard a guest whisper to another as the bride was about to walk down the aisle. Yes! It’s true! And what amazing moments they are – the moment he sees her walking towards him; the moment her father entrusts her to him; the moment they burst into laughter at the truths their officiant, a dear friend, shares; the moment they exchange vows with each other and really really realise the adventure they are embarking on. Real moments. And ones we feel so honored to capture. Location: Rosewood Mayakobá, Ctra. Federal Cancún-Playa del Carmen Km 298, Solidaridad, 77710 Playa del Carmen, Q.R., Mexico .